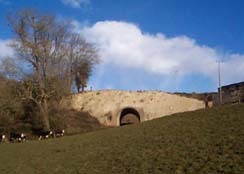 The Somersetshire Coal Canal was built to carry coal from the Paulton and Radstock coal fields to the Kennet and Avon Canal. Although the coal was relatively plentiful and there were markets for it across the South of England, sales had been small and prices high because the roads of the area were exceptionally poor. The SCC was built to connect the mines with the major towns and was a very profitable venture. 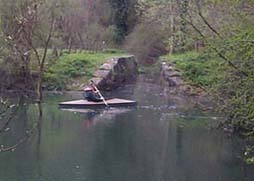 It comprised two branches, one from Paulton and one from Radstock, which converged at Midford and then connected to the K&A at Dundas. Click here for a short video introduction to the S.C.C. 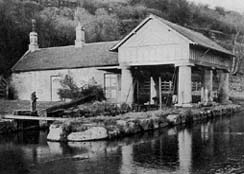 The drop of 135 feet from Paulton to Dundas was to be concentrated in a lock flight at Combe Hay, which would allow back-pumping with a Bolton & Watt mine-drainage engine to overcome the lack of water supply which was needed to operate the locks. Before the locks could be built, however, an apparently better solution appeared in the form of Robert Weldon's spectacular "Hydrostatick Caisson Lock". When this failed, a temporary inclined plane was installed and the lock flight eventually completed. The canal closed shortly after 1900 and most of it was drained for reasons of safety, however, there is still plenty to be seen if you know what to look for.